Most of the members of my EGA chapter focus on cross stitch, needlepoint, and other types of canvas work. I've always preferred working with surface embroidery, even though as a kid I thought it was called 'cruel' to reflect its difficulty, e.g. smooth satin stitched circles. Over the years my embroidery techniques have improved, but I've also learned not to dread imperfections. Crewel and needle painting are challenging, but slight variations in stitch execution become unnoticeable in the final work. (I'll probably never attempt Japanese embroidery, in which precision is de rigueur.) 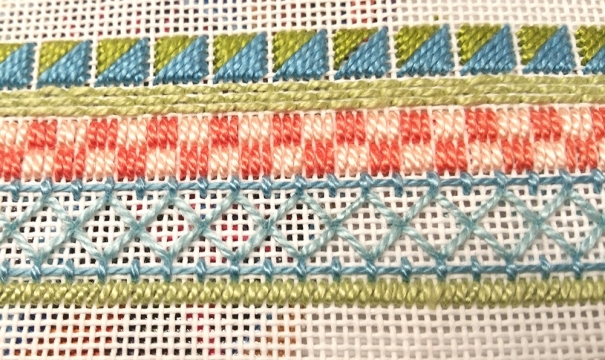 Trellis and other stitches, which require uniformity to be successful, are more frustrating so cross stitch, with it's painstaking of counting threads and stitches is tedious and less than fun. However, being surrounded by people who work beautifully intricate geometric needlepoint designs has me interested. If they can do it, surely I can too. As a means to expand my needlepoint stitch repertoire (tent) I've joined New Jersey Needle Artists, an ANG chapter.